Roadrunner Records signed a lot of big bands in 2009. Bands and artists like Slash, Kiss and Rob Zombie were offered to release their new album via Roadrunner, but Roadrunner didn’t forget about the smaller, upcoming bands. One of these upcoming bands is Dommin. This young American band from Los Angeles won’t stand a chance to win the award for most metal-looking band on the label’s artist roster, but their debut release Love Is Gone certainly impresses. During opener ‘My Heart, Your Hands’ Dommin seems to be a more modern sounding Type O Negative, but fortunately they have somewhat of a style of their own. It’s not that they play a whole new sort of music, but they’ve successfully combined elements from Type O, HIM, Volbeat and pop music. To finish their 15 songs they topped it with a lot of catchiness, while they sing about, probably the most “important” subject for the youth of today, love. While reading this it may sound a little bit cheesy, but you should definitely give Dommin a chance. The band is able to experiment with their own sound, without leaving their own musical path. 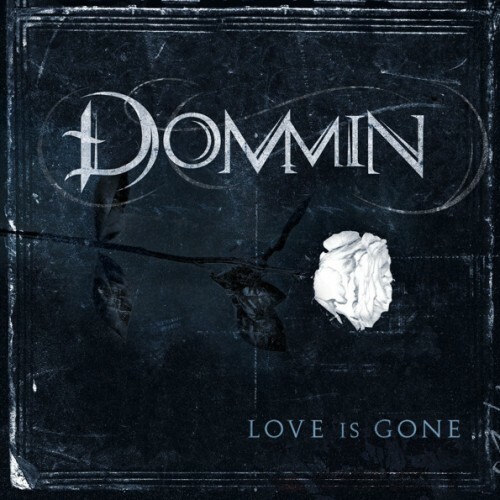 Also they have a slight advantages comparing them with other dark (gothic) rock bands, ‘cause Dommin’s lead instrument is the keyboard, with the guitar as big support, thus being able to create a more unique sound. Also the vocals deserve a big compliment. With a wide range, that Kristofer uses optimal, you’ll not get tired of his voice. Even after hearing the album multiple times in a row. Personal favorites: ‘Love Is Gone’, ‘Closure’ and ‘Honestly’.